Advanced Detection trains canines to find drugs and other drug related items. Our canines have very high rates of detection success once they have completed our specialized drug detection training. If you’re curious about this type of training and how Advanced Detection can help, you’ll find that our quick guide offers lots of valuable insight. 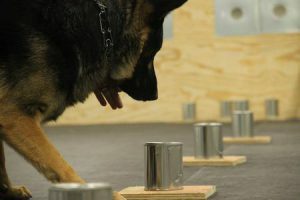 During drug detection dog training, dogs are offered rewards for using their keen senses of smell in order to find specific illegal substances. We carefully choose only the dogs best suited for detection work; those with a strong prey drive and communicative nature. We believe in positive rewards-based training. This style of training builds independent and confident dogs, ready to work in any environment. Our dogs detect marijuana, cocaine, crack cocaine, heroin, and methamphetamines. When a dog successfully locates drugs, it will signal the find with a passive alert (sitting and staring at the target). Advanced Detection trainers often utilize towels as toys for dogs. Usually, they pal around with canines extensively, using towels for playful and enjoyable tugs of war. At some point in the training process, bags of drugs are added to the inside of rolled towels. After some time passes, canines begin to associate the smell of particular drugs with the towels, which are the dog’s beloved rewards. This careful training process takes some time. However, eventually, dogs do gain the ability to sniff out drugs as they seek out their preferred rewards. Typically, canines who are receiving this form of training use an aggressive alert prompt in order to let their trainers know that they’ve hit “pay dirt” i.e. found the substance in question. Whether it is marijuana, cocaine or another drug, the canine will claw at the ground with his or her paws in order to send a clear and unmistakable message. As you can see, these types of trained drug detection dogs offer incredible benefits to law enforcement personnel. This is why the police and certain federal agencies, such as the DEA (Drug Enforcement Agency) utilize these talented canines on a daily basis, or on an as-needed basis. Advanced Detection currently offers drug detection dog training programs. Dogs will be vetted in order to see whether or not they are fully-trainable.